We’re appealing for information after a safe containing thousands of pounds worth of jewellery was stolen from a house in Esher on Tuesday (5 February). The theft happened sometime between 6am and 7pm at a property on Grove Way. Residents returned home in the evening to find the rear glass patio door smashed and the safe missing from the master bedroom. The safe has been described as being too large for one person to move on their own. 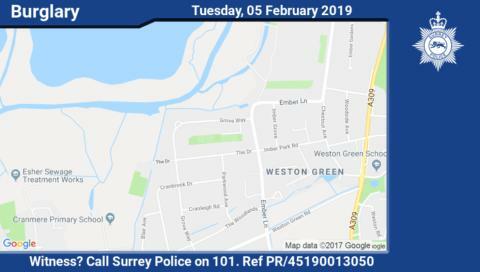 If you were in the area and saw anything suspicious, please contact Surrey Police on 101 (999 in an emergency) or http://surrey.police.uk/TellUsMore , quoting reference PR45190013050.